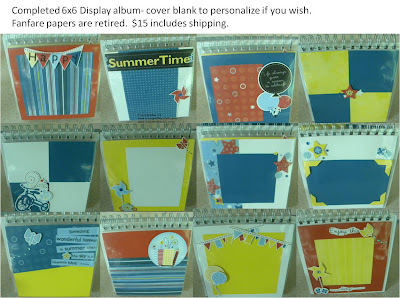 I just wanted to pop in and let you know that I have been selling a ton of retired items on my Facebook page- but wanted to post this one here as well- it is a GREAT DEAL! I taught this class last year for $25 as it included the album, paper, sparkles and stickease. But sadly, I never added photos to it and need to clean up some space. This album uses one of our 6x6 display albums with flip pages. the cover is completely blank and you can leave it that way or customize it. I have only the one sample available and will sell for $10 if you live local and want to pick it up- or $15 to ship anywhere in the Continental U.S. Contact me by e-mail if interested. Thanks and I hope you had a fantastic Thanksgiving!!! Get ready for the 12 days of Christmas!